Welcome to Las Brisas in Madeira Beach! We are a 4 minute drive to Johns Pass and a 15 minute beach walk to all the shops, restaurants and custard you can enjoy! Our lovely condo has THREE spacious bedrooms and two full baths. ALL FOUR BEDS in this condo have new MEMORY FOAM MATTRESSES (new in 2018) that are bamboo infused a GUEST FAVORITE! We are located on the third floor, with a beautiful ocean view that can't be beat! You can see, smell and feel the beach from the kitchen, dining room, living room and master bedroom. We have multiple chairs on the balcony for you to play boardgames and enjoy the salt air! The master bedroom has a king size bed (ALL BEDS NEW in May 2018) and a full bath. There are two queen beds in the second bedroom with a full bath. The third bedroom features one queen bed. The kitchen is fully equipped and all linens are provided. A laundry room IN THE CONDO with NEW SAMSUNG (Jan 2017) washer and dryer. There is a 42 inch flatscreen TV in the living room. Also, for your convenience, there is a DVD player and stereo. Las Brisas condominium is a 40 unit 5 story building. This location is conveniently located 35 minutes from the Tampa Airport and 25 minutes from St.Pete/Clearwater Airport. Other attractions include: Busch Gardens-30 minutes away, and Disney World, Epcot Center, and Universal Studios-approximately 90 minutes away. John's Pass is a few minute drive or 15-20 minute walk, Pirates Cove mini golf (voted best in Florida!) is just a few minute drive or 8 minute walk. John's Pass is a short walk down the beach. This is a popular destination for tourists. There are numerous shops and restaurants on the famous boardwalk. Other activities available there include: fishing and casino tours, parasailing, and boat and wave runner rentals. Nearby activities include miniature golf, biking, golf, sailing, surfing, windsurfing, shelling, sightseeing, and snorkeling. We love watching the water and relaxing at the beach, so we decided to buy a unit of our own and enjoy sharing it with our guest, who join us from the U.S., Canada and Europe! Though I am in the Mid-Atlantic region, my property manager is five miles away and is available to assist you. We chose this area to buy a condo because of the proximity to airports and attractions. There are many unique restaurants and shops within a short distance. Orlando is a 90 minute drive if you desire to visit the theme parks. Two airports are also within 35 minutes of this location, PIE (Allegant Air only) and TPA. BBQ grills on the property, and right on the beach! Allow the kids to play while you grill! There are many options for eating, but also all the things you may need, such as post office, bank and grocery stores, all within walking distance! Walmart is within a 5 minute drive, as well as dolphin tours, boat tours and great places to eat at John's Pass. We have a high-chair at the property as well! Get 25% off 3 weeks from September 8-December 15. 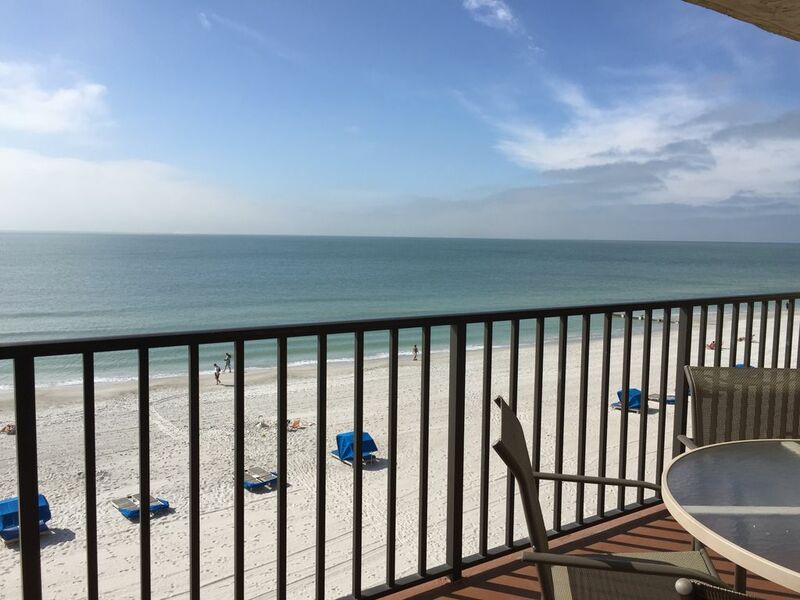 Our unit is right on the beach with beautiful views from the master bedroom and balcony! Gulf of Mexico views from the master bedroom and kitchen, living and dining rooms! One parking spot is available. Additional spots are available through the City of Madeira Beach for $20. but MUST BE reserved at least two weeks in advance of check-in. thanks for your review, although some things arent quite accurate. From the day the condo was booked you weren't not able to use the VRBO app. Although my phone number is displayed within, you called VRBO corporate pretending you can't get ahold of me. Parking pass, WiFi, and Code were communicated and downloadable/printable through the app. I tried the shower multiple times and it never went from hot to cold. Even as you tried to demonstrate it to Dominic it fluctuated a few degrees only. We even came over at 11pm on your move in day, as you were having problems using a standard Comcast remote. All in all, we are happy that you enjoyed your stay. Feet from the beach and heated pool! Great unit, had a great time staying there! Owner quick to respond to any questions! Our condo was wonderful. Location was perfect for our family. Clean, updated and convenient. We had a great family Christmas holiday vacation. We are still waiting on a refund! We arrived without being told the pool was closed for 45 days. We were told we would receive a full refund and were forced to find another place to stay. After multiple unreturned messages and being hung up on we reported the issue of misrepresentation to VRBO and are still waiting for a refund. The pool sustained damage in the prior week due to weather damage and was being repaired at the point of rental, which we are extremely sorry for, but what is also out of our control. You were offered a different pool to use which is the exact walking distance as the one on site. You were not forced to stay at another property. You voluntarily left as you were not happy with the pool solution or the discount/refund option we offered. Your key code to the condo worked till the check out date. There was also no misrepresentation at the time of booking, as there is a pool on the property, and just temporarily unusable due to a higher power. The ticket was closed by VRBO after looking at our conversations on the website, because the accusations were unsubstantiated. 3. Didn't realize that the 'master' bathroom was actually a share bathroom for everyone to use while the second bedroom facing the parking lot had a private bathroom (go figure). 4. The patio door was very noisy when open or close - did not realize this until someone in another condo continuously open and close their patio door after 11PM and you are trying to sleep. This goes on for the entire week. 1. Good location - beach front was nice and near to shopping like Walmart, Publix, etc. For the price, it was OK but definitely not great. I am sorry to hear that our condo didn't satisfy you. We strive to make sure our guests have a pleasant stay. We never heard from you regarding any of these issues during your stay. If we had known, we would gladly have rectified it to make it right. As you can see from our reviews, we have repeat guests every year who enjoy family vacations every year at our condo. 1) The door code you were given was correct but, unfortunately, you entered the code incorrectly more than 5 times, therefore you were locked out. Understandible since you arrived at 230am, but please note that when you texted at this time, you were provided with our an alternative code within 9 minutes despite the late evening/early morning time. 2.) Our communication does not convey that parking is assigned by parking pass, and it was communicated that a pass is not necessary. The parking spot is clearly marked for each unit, and ours is the second spot as you enter the community, so it is not hard to find at all. 3) To ensure our guests are aware of the layout for their vacation, we have photos that show the inside from most all angles. We have never had a complaint on the interior and the two large bathrooms for our condo. Lastly, we also have no influence on what residents in other condos do at what time; however, if the noise was bothersome we could have had the condo management take care of it if you had brought it to our attention. I agree that the elevator is not the fastest and sometimes there is a 2-5 minute wait for it, but according to the condo management company, the elevator had no outage. Please read the other reviews and you will see the great care our property manager Dominic takes to ensure our guests have a relaxing and enjoyable stay at our beach home. Our entire family had a great time. This condo had plenty of room for all six of us, with the balcony ending up as a favorite place. It was pretty amazing that we could go from in our room to on the sand within about three minutes. While the outside of this building (and maybe the elevator) is ready for a little TLC and updating, the unit itself was wonderful. The location was amazing, the view from the balcony was amazing, the beach was great. Part of what I really enjoy about this area is the lack of overcrowding. Our family was able to go out on the beach and not be overrun by others (the only loud noises were the breeze in our ears and waves crashing on the shore). Our family also enjoyed being able to run from the beach to the pool in a minute. I would definitely recommend this rental to others. Having a code for the door lock was way more of an advantage than I expected, so kudos for that as well. Be sure to take advantage of the full kitchen and cook at home. Saves some money and allows time for game nights :)! Property manager was very responsive to messages. Thank you for great review! I agree with the elevator situation, it could be a lot faster. The condos are being renovated on the outside in this fall during the off-season, while the inside was just redone last week. Thanks for staying with us in 2018 and we hope we can welcome you again in 2019! Our Favorite Things to Do in Tampa/ Saint Petersburg! Madeira Beach - Take a walk up and down the beach, enjoy our beautiful sunsets or rent a padded beach chair and just relax! You can also drive down to Clearwater Beach for a day of fun in the sun, walking/biking paths and lots of restaurants and shops to visit! John’s Pass - Visit the little shops and restaurants at John’s Pass and the Boardwalk where you can rent jet ski’s, boats, kayaks, or go out on a fishing trip or a dolphin tour. When you walk the boardwalk or while you dine, enjoy live music and watch the dolphins and boats come and go. Smuggler’s Cove Adventure Golf: Voted the #1 mini-golf site in Florida! (1-minute drive/9-minute walk) - 15395 Gulf Blvd. Tampa Attractions: Busch Gardens: 50-minute drive – 10165 North McKinley Drive, Tampa; Lowery Park Zoo: 50-minute drive – 1101 West Sleigh Drive, Tampa; International Plaza Mall – 2223 North Westshore Blvd., Tampa. o Dunkin Donuts (1-minute drive/5-minute walk) - 14361 Gulf Blvd. o Amish Creamery Company – (2-minute drive/5-minute walk) - 211 150th Ave.
-	Walmart Supercenter (6-minute drive/50-minute walk) – 10237 Bay Pines Blvd. -	Surf-Style (1- minute drive/8-minute walk) – 15327 Gulf Blvd.